There seems to be a permeating myth that if brands can hit a magic content number, then they’ll be able to enjoy viral success and countless leads. This magic number doesn’t exist. Instead of focusing on word count, consider the content type when you’re writing. This will help you convey the right information in a tone that appeals to your customers. For years, marketers and content creators have debated over content types. 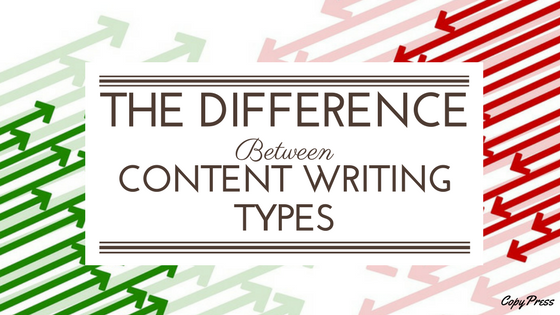 Here’s what you need to know about the various content writing types for your marketing strategy. Some marketing funnels are longer than others. Consumers spend more time deciding what kind of car to buy than where to go to dinner. However, this doesn’t mean that all parts of the sales funnel aren’t important. Successful content creators build their marketing plans around their industry’s sales funnel. They understand the questions customers have that are keeping them from buying and work to answer them. If the wrong content is presented for the part of the funnel where the customer is, then they could bounce, feel alienated, or decide not to buy. Follow this guide to better understand the characteristics of each type, including the content length, and how they can impact your sales goals. Blog writing is the shortest form of content on the web. Typically, blog articles are 300 to 600 words and are meant to be quickly skimmed. The lightness and scannability of blog articles mean they’re typically presented as top-of-funnel content. Blog articles are typically used in social media to drive traffic to your website and increase awareness about your brand. Full articles are occasionally added to newsletters to share news or make announcements. Depending on the industry, these articles are typically entertaining or informative. They might introduce a concept at a high level or share some advice that customers would find useful. While some people might be tempted to track the leads generated in blog posts, top-of-funnel articles aren’t made to immediately generate revenue. However, increased metrics such as traffic, clicks, and engagement can have a significant impact on your business. Without a steady flow of new traffic, you can’t expect your sales, conversion rate, and overall revenue to grow. Typically, the goal of long-form content is to educate audiences and boost search engine rankings. In fact, Neil Patel found that the average word count for top-ranked searches is 2,416 words. Search engines prefer long-form content because there’s an increased chance that the audience will find something of value in it. Engines like Google also know that site visitors will stay on a single piece of content for several minutes as long as it’s informative or entertaining. Outside of the search world, long-form content (typically 500 to 3,000 words) is used to provide in-depth discussions on topics. While a blog post might offer three to five tips for success, a long-form article could have a complete how-to guide, survey on best practices, and case studies from people who experienced the problem before. Most brands use long-form to bring customers into the middle of the funnel and toward the bottom. Your audience is already familiar with your brand, but it wants to know why your company is the best. Your long-form content proves that you’re an industry leader and can be trusted to do a good job. Successful long-form content will have staying power. Some marketers report getting links on their top long-form pieces for months or even years after publishing them. Marketing materials range in length but tend to provide in-depth details about a business’s products or services. These materials might include topics about its product development process, where it sources its materials, or upcoming sales and offers. Marketing materials can live on the blog or serve as website copy with their own landing pages. These marketing materials exist at the bottom of the funnel. Customers are aware of your brand and understand the need for your services, but want to know why your company, in particular, is the best. Your brand might focus on your quality products, customer service, or price value. As you can see, by the time your customers have reached the bottom of the funnel, they’re ready to talk to a sales person and consider buying from you. Some marketers make the mistake of turning every piece of content into an advertising piece. While this might seem like an effective way to convert customers, it goes against the concept of the sales funnel by turning every interaction into a conversion-based reaction. Furthermore, brands that exclusively create marketing pieces could struggle to generate search engine traffic. If visitors bounce because they don’t see the value in your content, then Google could start to penalize you for creating low-quality work. Most marketers develop a mixture of all three content types for their promotion strategies. Depending on their budgets, they will develop a handful of long-form pieces each month along with blog posts and marketing materials to go along with them. One article won’t save your content plan; you need a whole support system to make your digital strategy thrive. The Importance of Content Communities SEO Metrics: What Is Important?